In Greek mythology, there are three women known as the Fates. They are responsible for spinning the destiny of each person at his or her birth. It is not surprising that the Fates are spinners because the wheel of fortune is an apt image for the elusive turns of a man's fate. This is the theme of Card 10. 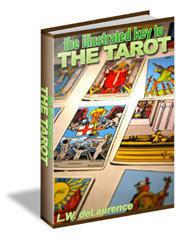 The Wheel of Fortune is one of the few cards in the major arcana that does not have a human figure as a focal point. This is because its center is above the realm of man - in the higher levels (clouds) where the destinies of all are woven together in the tapestry of life. 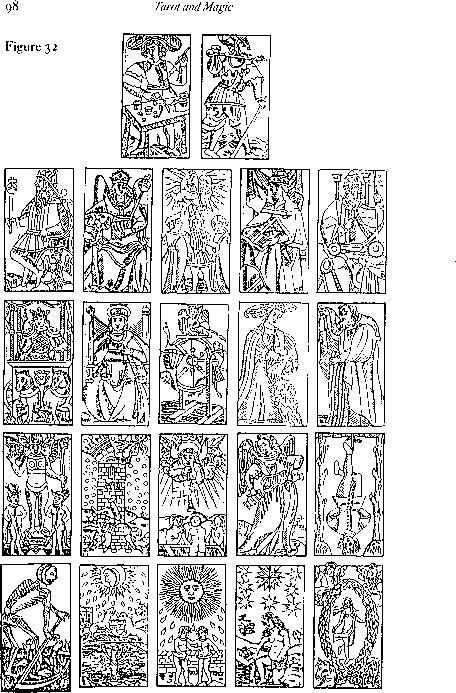 The tarot recognizes that each person sets his own path in life, but is also subject to the larger cycles that include him. We experience chance events that appear to be accidents although they are part of the great plan. In readings, the Wheel of Fortune can indicate a vision or realization that strikes with great force. If you've been struggling with a problem or tough situation, this card can signal that you will find the answer if you stand back and view everything from a larger perspective. The Wheel of Fortune also represents unexpected encounters and twists of fate. You can't predict surprises; you can only be aware when one is circling around. Indeed, Card 10 often suggests wheel-like actions - changes in direction, repeating cycles and rapid movement. When the energy of the Wheel arrives, you will feel life speed up. You are caught in a cyclone that may deposit you anywhere. "Round and round and round she goes, and where she stops, nobody knows."